What an enterprises 'knows' is embedded in its operational routines, in documents and databases, and in the heads of its people, who may have relevant domain knowledge, but also be aware of external others who have particular domain knowledge. External others such as customers may also influence the nature of operational routines and contribute explicit forms of others. From this perspective, 'corporate memory' has some internal and some external components. 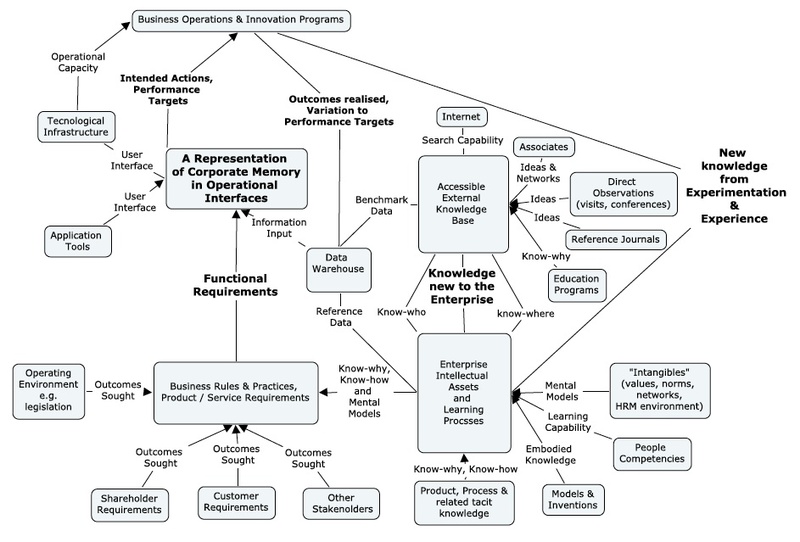 New knowledge is generated from experience from current operations and experience external to the enterprise. The concept map below is a representation of elements of a continuously evolving 'corporate memory and the interactions between these elements.